* The official weight is in pounds. For your convenience, the minimum acceptable weights in kilograms are 45 kg (100 lb. ), 29 kg (65 lb. ), 20 kg (45 lb.) and 15 kg (35 lb.). For each workout, be sure the athlete has adequate space to safely complete all the movements. Clear the area of all extra equipment, people or other obstructions. Any athlete who in any way alters the equipment or movements described in this document or shown in the workout standards video may be disqualified from the competition. Prior to starting, film the pull-up bar, plates and barbell to be used so the loads can be seen clearly. All video submissions should be uncut and unedited in order to accurately display the performance. A clock or timer with the running workout time clearly visible should be in the frame throughout the entire workout. Shoot the video from an angle so all exercises can be clearly seen meeting the movement standards. Videos shot with a fisheye lens or similar lens may be rejected due to the visual distortion these lenses cause. This is a standard barbell thruster in which the barbell moves from the bottom of a front squat to full lockout overhead. The bar starts on the ground. No racks allowed. The hip crease must clearly pass below the top of the knees in the bottom position. 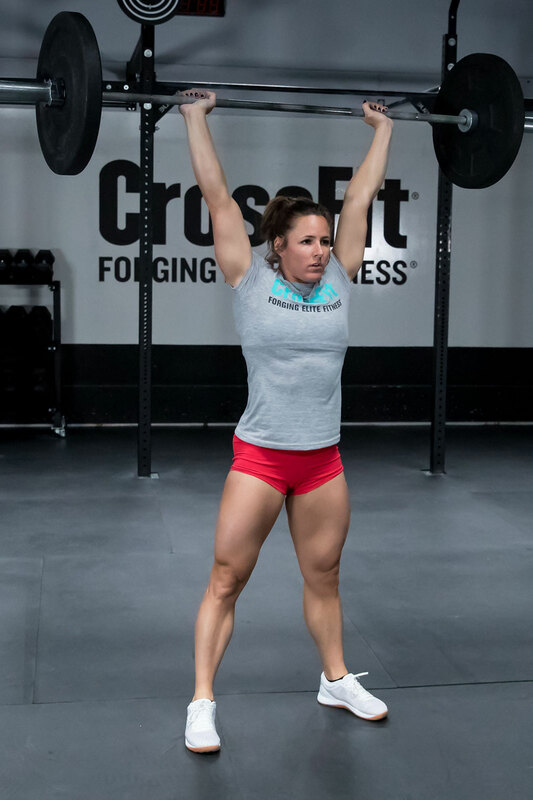 A full squat clean into the thruster is allowed when the bar is taken from the floor. If the barbell is dropped from overhead, it must settle on the ground before the athlete picks it up for the next repetition. Using a ball, box or other object to check for proper depth is not allowed. 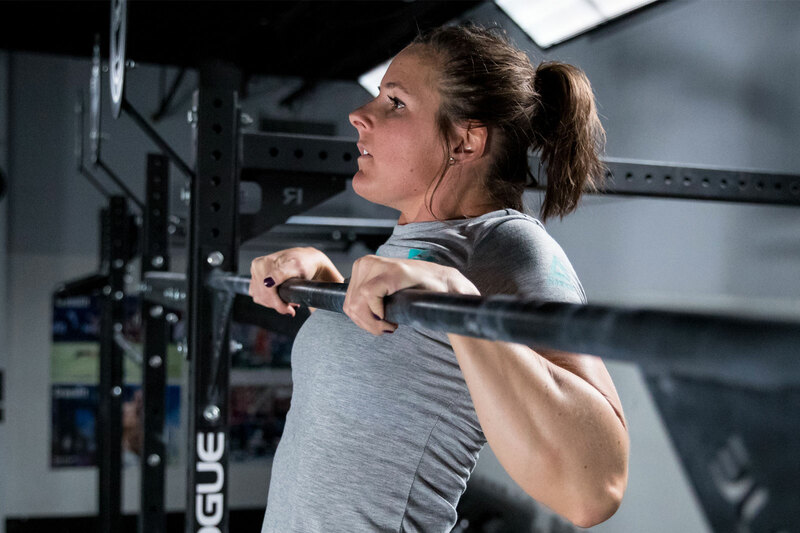 The barbell must come to a full lockout overhead, with the hips, knees and arms fully extended, and the bar directly over the middle of the athlete’s body. This is a standard chest-to-bar pull-up. 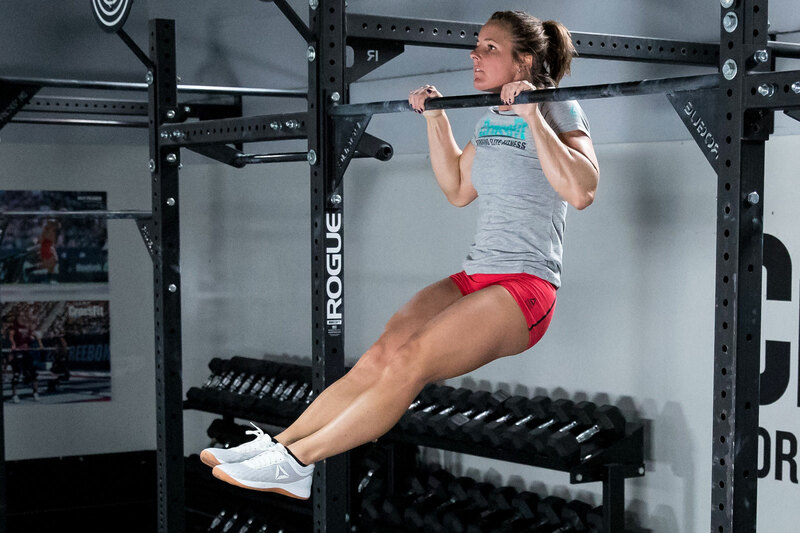 Dead hang, kipping or butterfly pull-ups are allowed as long as all the requirements are met. The arms must be fully extended at the bottom, with the feet off the ground. Overhand, underhand or mixed grip are all permitted. At the top, the chest must clearly come into contact with the bar below the collarbone. Athletes may wrap tape around the pull-up bar OR wear hand protection (gymnastics-style grips, gloves, etc. ), but they may not tape the bar AND wear hand protection. 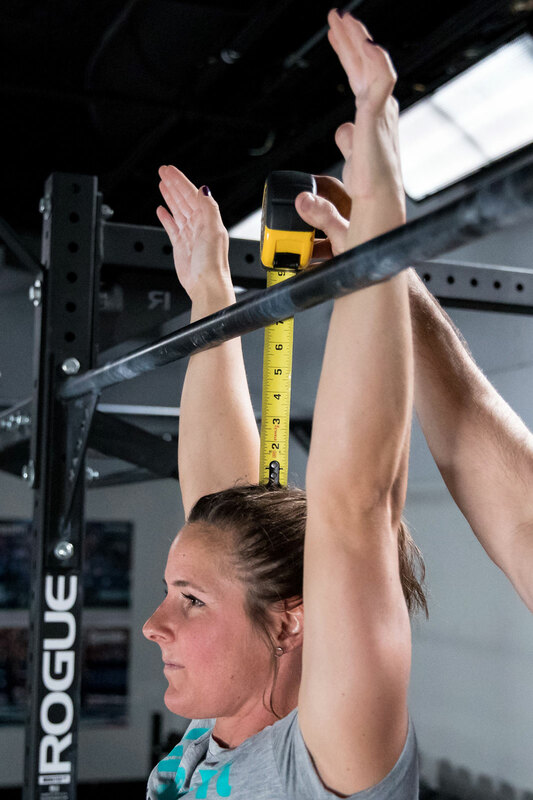 For jumping pull-ups, the bar should be set up so it is at least 6 inches above the top of the athlete’s head when the athlete is standing tall. At the bottom, the arms must be fully extended. Overhand, underhand or mixed grip are all permitted. 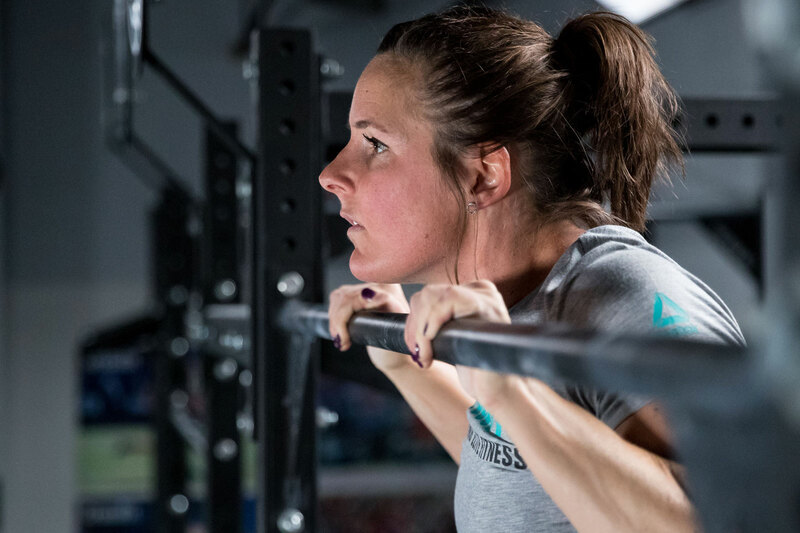 At the top, the chin must break the horizontal plane of the bar. Athletes may wrap tape around the pull-up bar OR wear hand protection (gymnastics-style grips, gloves, etc. ), but they may not tape the bar AND wear hand protection. 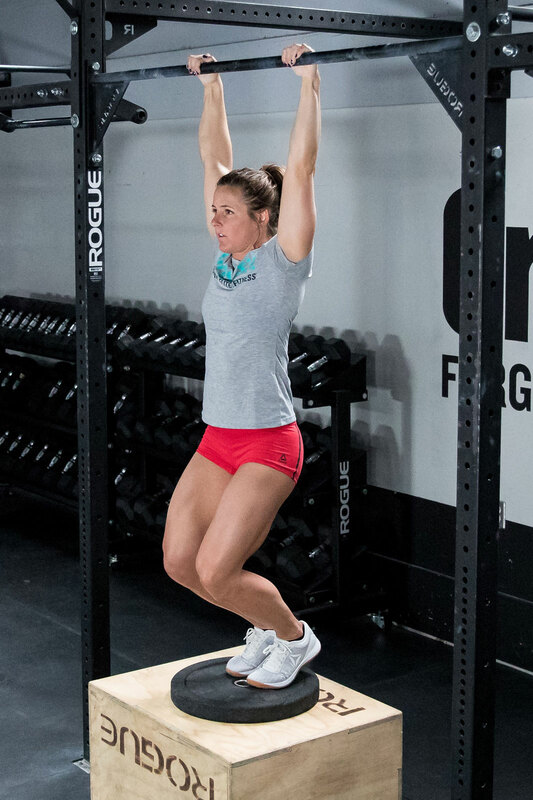 This is a standard chin-over-bar pull-up. Dead hang, kipping or butterfly pull-ups are allowed as long as all the requirements are met. The arms must be fully extended at the bottom, with the feet off the ground. Overhand, underhand or mixed grip are all permitted. At the top of the movement, the chin must break the horizontal plane of the bar. Athletes may wrap tape around the pull-up bar OR wear hand protection (gymnastics-style grips, gloves, etc. ), but they may not tape the bar AND wear hand protection.